This article is a part of the Poker Strategy series. I have made a decisive decision for my person bankroll building project. In order to reach my 200$ poker bankroll goal I am going to make a radical change in my general poker strategy. I will start using a short stack strategy from now on. My short stack strategy is a modification of the famous Ed Millers short stack strategy. Basically the Ed Millers short stack strategy is based on the fact that short stack players have an advantage compared to the other full stack players at the table. In short – and I will go into more details about this in later bankroll building updates – when you play the short stack strategy you often get folding equity for free. Folding equity is the value you get when your opponents fold. Let’s say you are using the short stack strategy and have 5$ at a table where all the other players have 50$ and you pick up QQ. You go all in preflop and get two callers. One of the two callers bets on the flop and the other player folds. You win the hand against the remaining player, but would have lost if the third player hadn’t folded. Your folding equity in this hand was that one of the preflop callers forced the other caller -who otherwise would have won the hand-to fold. In late position I will add 88, AJs, 77, AJo, ATs and KQs to my raising hands, go all in on the flop and on preflop reraises. When I am in Big Blind and don’t have an early position starting hand, I check if there are no preflop raises. On the flop I only bet if I hit something good like two pairs, and I only call with drawing hands if the pot odds are ridiculously good. When I am in Small Blind and don’t have an early position starting hand, I call up to the big blind if there are no preflop raisers, otherwise I fold. On the flop I only bet if I hit something good like two pairs, and I only call with drawing hands if the pot odds are ridiculously good. If I have raised preflop in position and don’t hit the flop I go all in if my opponents check. If they make a significant bet before me I evaluate the situations on a case to case level. I would say I fold the majority of the times when my opponents bet. As this was posted 6 months ago, you probably have written feedback somewhere else. The only comment I have is that the short stack strategy that I see online is that short-stackers get allin preflop. They do not bet half their stack first, then the other half at the flop. 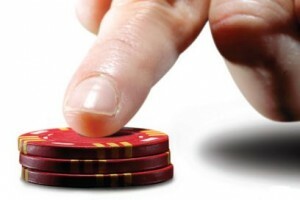 – betting 50 pre, 50 post is predictable as your opponents know you will bet the rest at the flop. This is inferior to allin preflop because it is cheaper for them to see the flop knowing that you are allin anyway. It could work if there is large turnover though. Most other short stack strategies agree with betting 50% of your stack preflop and the rest after the flop. You wan’t action (from a couple of players) with your premium hands, and an all in is less likely to be called by anyone at the table. However mixing your play up is always a good idea so sometimes you could go all in preflop to fake stealing blinds. Basically, it does seam to be a working strategy, but I think you should not be so strict on calculations. And if I were you I wouldn`t chose a low stack strategy, I`d rather play the poker than do this, but this is me not you. And me again, I`d like to tell you that I would not play with someone like you any hand if we were at the same table because I can see myself that when you`re allin preflop it`s obvious that you have a big pair or premium cards in hand, so I`d pay you only in the same situation so that would be a hand played totally on luck. Mathematically that is a poor way to play poker, also there is no “theory” ever even mentioned in the blog post. I have reviewed your forum thread about your updates and notice you did not achieve your goal and just left the thread dead. “Sucky Sucky is my only comment….” are your last words. That is the reason why I reply to this “hall of fame” blog, because your giving false information on how to achieve a bankroll with short stack strategy, with no proof it works. I can only wish more people that play poker read this as it would increase my poker bankroll with out much effort. First of thanks for reading my article on short stack strategy play and the forum thread. I agree that short stack play is not the most nuanced way to play poker since it basically boils down the game to a predefined set of rules that you just follow like a machine. You will not develop your overall poker skills by following the short stack strategy. However, I do think the strategy is profitable in the long run. If you read through my forum thread carefully you will see that moved to a higher limit which I was underrolled for. This was a prime example of why it’s so important to practice good bankroll management, but does not necesssarily mean that the short stack strategy does not work. I’ve read off and on for a few months the pages on this here site, some good, some bad.. just like hole cards……………no page break?…………………I don’t question the short stack strategy works, I’ve done it a number of times. My concern is your theory, with nothing for proof. Mathematically your system is flawed, in my view. I wish to only understand how you presume yours does, it is your theory after all……………….there is nothing wrong with teaching players a system, but it is no good if there is no understanding to how it will work. In order for me to respond to your claim that the short stack strategy is mathematically flawed, you will have to specify what these flaws are. I would also like to point out that the short stack strategy is not my idea. I guess Ed Miller was the first to formulate it and what I’ve done is make my own modifications. You write in your comment that you have tried the system yourself and seen that it works. Doesn’t that contradict that the math is flawed? If what you really want is an article explaining the math behind the short stack strategy I will definitely consider writing it. It doesn’t contradict at all actually, as I don’t use the same system you are using….but I think your missing my point. ………….your trying to provide a bankroll building strategy, that you have tried and failed……….. This theory is all about math, and it would only benefit the readers to understand why it should work………..
First of all I am not trying to provide people with a short stack bankroll building strategy. It has been a project of mine which I found interesting enough to share with whoever wanted to read it. Sure it ended with me giving up the strategy but that was mostly due to playing underrolled and finding out that I am a poker tournament player. I totally agree that it would benefit the readers to know the math behind the short stack strategy. If you believe your strategy is less flawed than mine let’s have a discussion about the math behind. Where for example do you think my strategy is flawed, and how does your strategy fix these flaws? It would be great to write an article with you presenting an improved short stack strategy! I tried the short stack strategy over the last five days. Initial results were promising, but I noticed that short-stacks are very susceptible to traps. A big stack who has a solid pocket pair, top pair, etc will check-raise you on the flop, fully expecting you to go all-in first before hooking you. And it is useless on loose tables. You’ll be called down with bottom pair. In my last hand my all-in was called with Q-high. The all-in on the flop just looks SO bluffy, even the fish will notice. I just wrote a long reply to your comment and then the bloody Internet f…cked it up so I lost everything I wrote. Hate it when that happens. Anyway I have a comment to the stuff you write about big stack players trapping you and the short stack strategy not working on loose tables. When you play the short stack strategy you will always have some kind of hand when you raise preflop. Whether this hand improves or not on the flop, it will often be good enough to beat loose players calling with bottom pair or Q high. As for big stack players trapping you, I guess this is something you will have to look out for and try to avoid. I would love to hear how the short stack strategy works out for you in the future. short stack strategies is very good because you minimize your loss and its rarely hard for you to get bluffed out of pots. if you were to buy in for a full amount it would be easier for stronger opponents to out play you since you may fear of loosing your whole stack, also another positive to the short stack strategy is that it tightens up your play meaning you will be only playing stronger hands, which is good. but a downside to short stacks is there really isnt that much room to bluff. BUT WHO REALLY BLUFFS ANYWAY!!!!!! To play according to the short stack strategy you need to play at full tables (7-10 players). If the number of players at the table is less than 7, you should leave it and join another one. There should be as many players with full stacks (more than 50BB) as possible. When you join a table your stack should be 20BB. If your stack has reached 10BB or less you should buy more chips to have 20BB. .-= Mark´s last blog ..PowerPoker poker bonus deal by Poker Bankroll Blog =-. People like you who use this “strategy” are single-handedly ruining online poker. If it were up to me, I’d have you and everyone who uses it permanently banned from every poker service. You should be ashamed to call yourself a poker player. Lol that’s a bit harsh isn’t it? IMO poker is about maximizing your winnings through finding your edge against other players. If you edge happens to be a short stack strategy, then what’s the problem?I’m sure there are plenty of strategies out there to fight short stack players. The one thing i would suggest is moving tables alot, to keep your oponents thinking.. as its quite a simple strategy i’d think your A high all ins post flop will start to get called after force folding narrow middle or bottom pairs, also avoiding any prolonged periods spend with “chip happy” individuals would help too. Thanks for your sharing your views on this strategy. I’m pretty sure many full stack players will call with their middle pairs most of the times when an Ace doesn’t hit on the flop. In this situation you might be getting good enough pot odds for hitting your high card that an all in on a low card flop isn’t that bad a move. @Andy: What’s flawed about it? I kinda agree with what Lee has to say – I definitely feel that although some strategies can be described as “shrewd” – or even “cunn(t)ing” – it depends on the individual. Everyone has their own game plan and in the end what matters is who’s winning!